(Click to enlarge) High school graduate Amy Olson extracts oil sample after exposure to simulated sunlight. Olson worked in UNO’s 2012 summer outreach program for high school students and undergraduates. 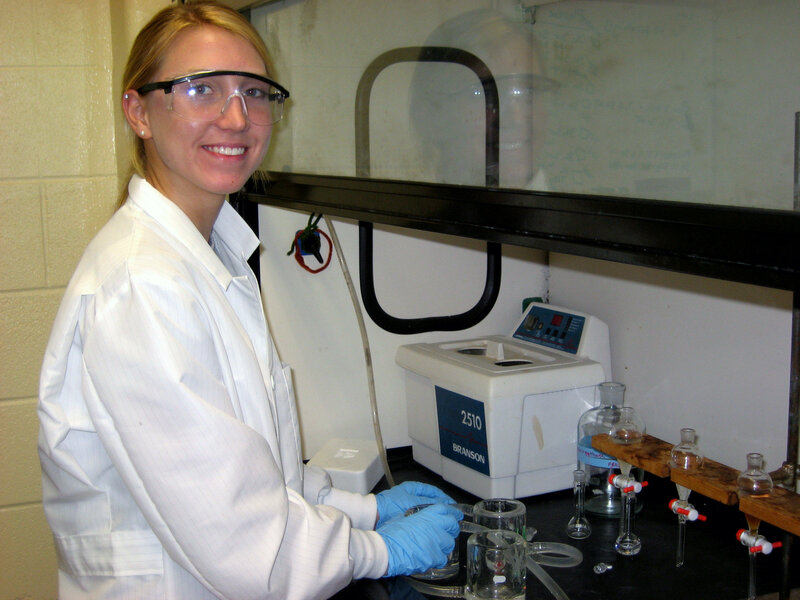 This GoMRI project will include both undergraduate and high school students in summer research on the effect of sunlight on oil compounds. 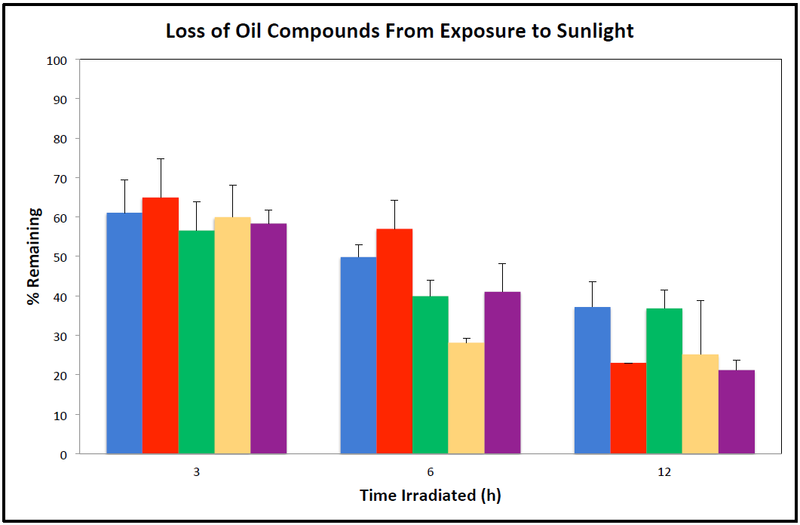 Through a GoMRI RFP-II grant-funded study “Effect of Photochemistry on Biotransformation of Crude Oil,” Dr. Tarr, along with Russ Schmehl of Tulane University and Amy Callaghan and Joe Suflita of the University of Oklahoma (OU), will look closely at how light impacts surface oil. In the same manner that sunlight hitting human skin can cause it to change colors, light hitting oil causes chemical changes that can be studied and measured. The team will look specifically at the photoproducts produced by this chemical reaction: What are their mechanisms? Are they toxic? Are they more or less biodegradable than oil molecules that have not been exposed to light? How does the presence of dispersant affect their behavior? In the immediate aftermath of the Deepwater Horizon Oil Spill in 2010, Dr. Tarr chartered an out-of-work fishing boat and collected oil from the surface of the Gulf of Mexico (GOM). In addition, BP gave him source oil, or oil taken directly from the well-head, to study. At UNO, Tarr will put these samples, along with the GOM water they were collected with, in a solar simulator and irradiate them for various lengths of time, with and without dispersants. At that point, they will be shipped to OU, where Callaghan and Suflita will test both the resultant water and oil separately to determine relative toxicity and biodegradability. They will also look at the biodegrading bacteria itself to see whether the presence of sunlight helps or hinders them in their work of consuming oil. Finally, Schmehl at Tulane will focus on the mechanisms of the process on a molecular level, i.e., how much light exposure causes oil molecules to enter the “excited” state required to produce photoproducts and how long this state lasts.